Would you look at this? Kids are back in school and I have a little bit of time to update the blog! I actually recorded this baking tutorial while all 8 of them were home, and they were shockingly quiet – or outside in the pool the whole time. 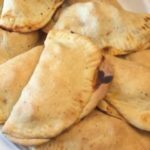 Empanadas were introduced to our family last year through our au pair Tatiane who was from Brazil and since their introduction, I have, of course, put my own healthy spin on this quick and easy meal. 2 cups of almond milk – bring to a simmer (NOT BOILING! ), take off stove. Add 1/1/2 cups of lard (or bacon grease) and 2 TB Butter. Let melt and cool. Add 5 tea of yeast. Stir. Add 5 cups of flour and 1-2 tea salt (depending on how salty you like your food). Stir until incorporated. Kneed this mixture for about 5 minutes and let rest and rise for at least an hour. Make filling – Check Pinterest for recipes or the fridge for leftovers. Roll out small pieces of dough into a disk shape. Fill with whatever filling you’ve made. Fold over, crimp edges if you want to, put on a baking sheet and bake for 15-20 minutes until golden brown. Enjoy! 2 cups of almond milk - bring to a simmer (NOT BOILING! ), take off stove. Make filling - Check Pinterest for recipes or the fridge for leftovers. Roll out small pieces of dough into a disk shape. Fill with whatever filling you've made. 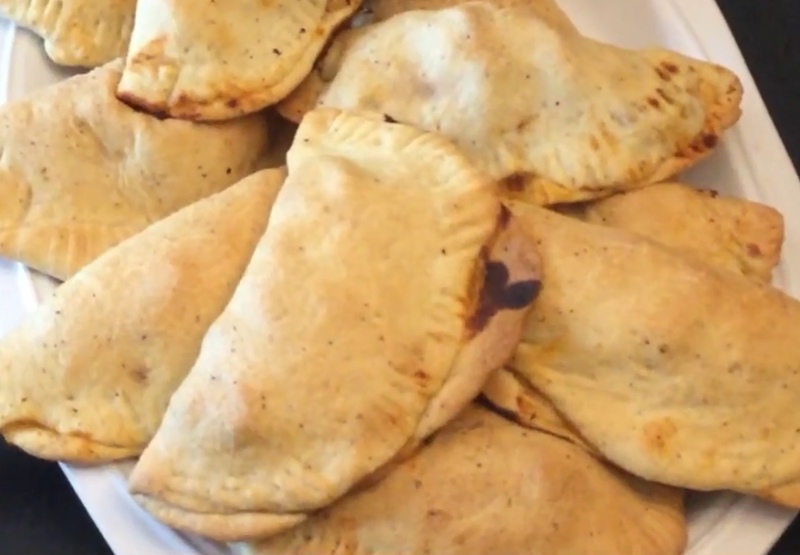 Fold over, crimp edges if you want to, put on a baking sheet and bake for 15-20 minutes until golden brown. Enjoy!